Fajita Stuffed Chicken, One-Pan, Cheesy and Absolutely Delicous! After making this incredibly delicious fajita stuffed chicken recipe, I’ll never eat boring chicken fajitas again. Because this fajita stuffed chicken is a protein packed meal, full of cheesy deliciousness, seared to perfection and sprinkled in spices. Not to mention, it’s full of veggies even anti-vegetable peeps won’t notice or mind. 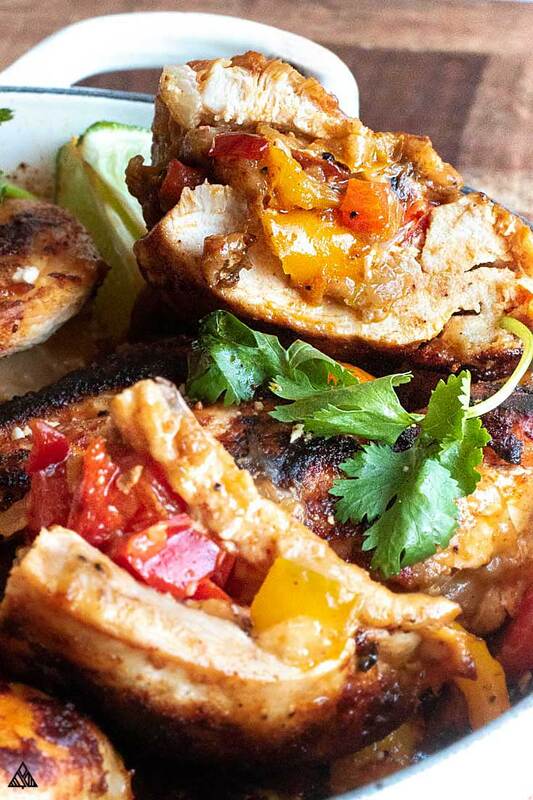 This healthy fajita stuffed chicken recipe is as easy as low carb chicken recipes come. Whether you’re searching for quick and easy low carb dinners, or a make ahead meal to pack in your low carb lunches, this fajita stuffed chicken is here for you! Cook the low carb vegetables before stuffing them inside your chicken — this helps to release water and enhance the flavor of your vegetables, so don’t skip this step! Shredded pepper jack is life! I love the flavor of shredded pepper jack, especially in this low carb fajita stuffed chicken recipe. Swap it with whatever cheese you have on hand — cheddar and mozzarella are both delicious in this dish. Cut a small “pocket” in the chicken breast for your filling. I do this by placing my hand over the top of the chicken breast and carefully cutting halfway through the chicken, only cutting into one of the edges. This keeps the filling “stuffed” inside. Trust me, this sounds way more complicated than it is. 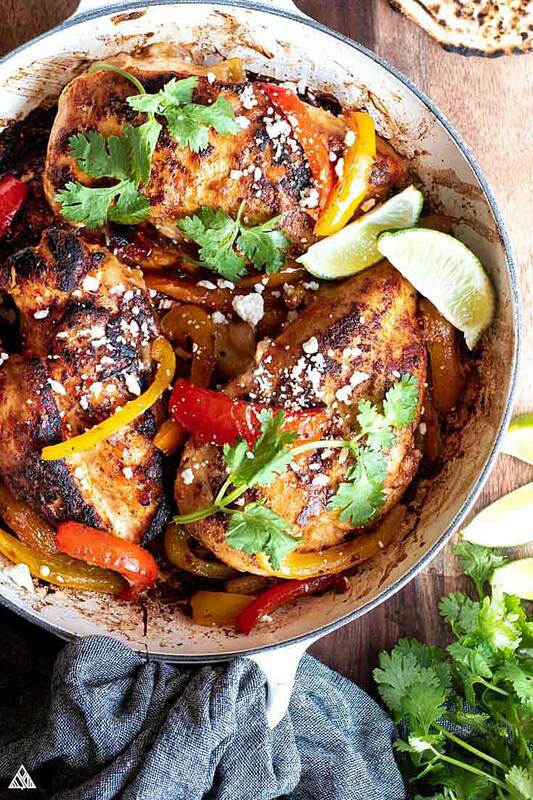 Season your fajita stuffed chicken. If you have extra low carb taco seasoning, use that to coat the chicken breast. Otherwise, the spices in the ingredient list below make for a delicious coating! Be sure to pat the fajita stuffed chicken keto seasoning into the chicken for full flavor/crust effect. 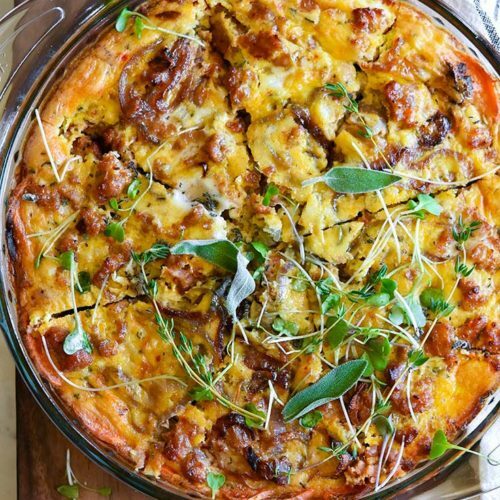 Store your tasty fajita chicken bake in the fridge for quick and easy low carb meals! 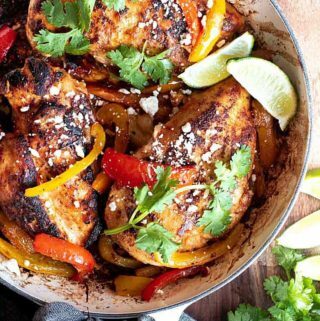 Searing the this fajita stuffed chicken brings out the flavor and creates a sort of “crust” with our delicious seasoning — unfortunately, this cooking method won’t cook our chicken all the way through. So, by placing our skillet into the preheated oven, we maintain that crispy edge and slowly cook the meat all the way through. You can skip the searing step if you’d rather not stand over the stove — but your chicken will bake longer in the oven. Adjust accordingly. It’s important to note that all chicken breasts have different thicknesses, and all ovens operate at varying temperatures. Cut the thickest fajita stuffed chicken in half to make sure it’s cooked all the way through before serving. Chicken breasts are larger. I love chicken thighs, but they’re significantly smaller — chicken breast allows us to stuff more of the delicious fillings into each serving. 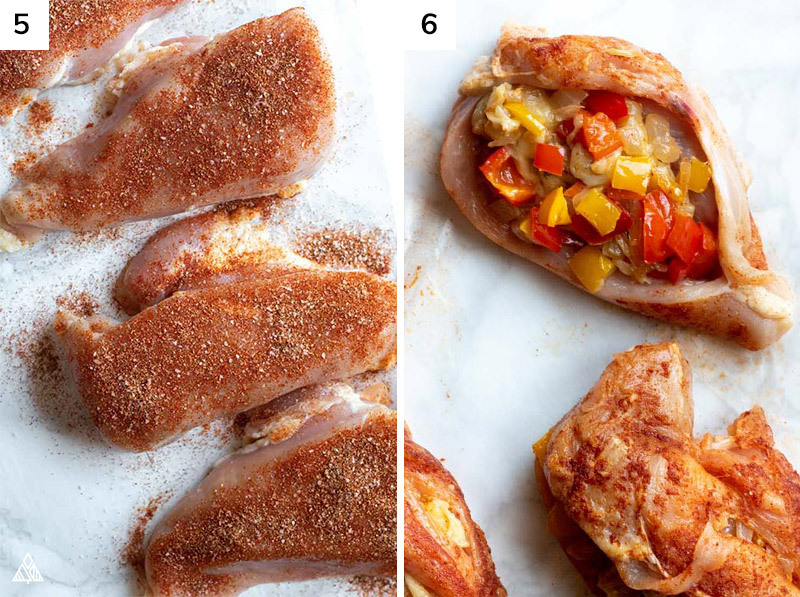 If you’d like to make fajita stuffed chicken thighs instead, no problem! Just adjust your bake time accordingly. Thighs take about — minutes to cook through and through. 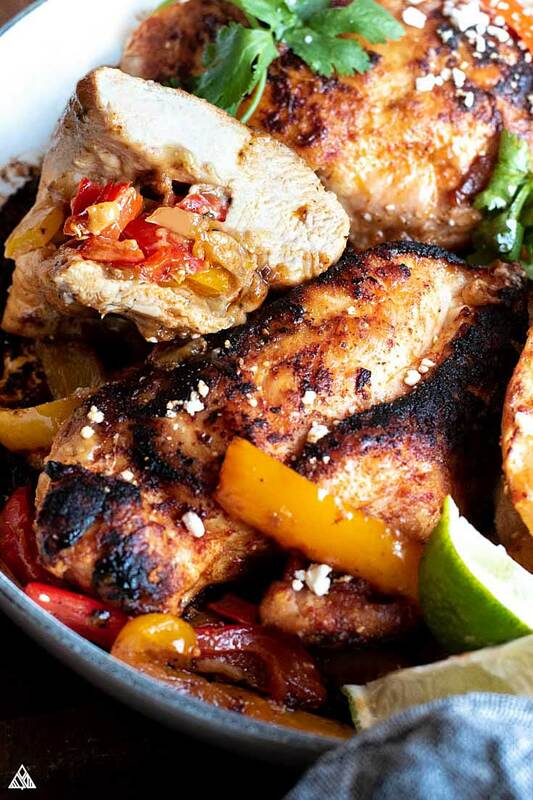 Start there and adjust your fajita stuffed chicken accordingly. It’s only natural to stuff cream cheese inside chicken — if that’s what you’re craving, it’s an easy adjustment! Instead of adding 2 cups of pepper jack, use 1 ½ cups + a ½ cup of cream cheese (we want to keep that gooey-ness from the shredded cheese. Think of it as the “glue” that holds our fajita stuffed chicken together!). Cream cheese stuffed chicken is delicious, duh! As I said before, this fajita stuffed chicken is the perfect dish for low carb meal prep! I like to double this recipe (less work in the long run), and portion it out for the work week. Whatever we don’t finish in time gets frozen into individual resealable baggies (labeled with the name and date of course). 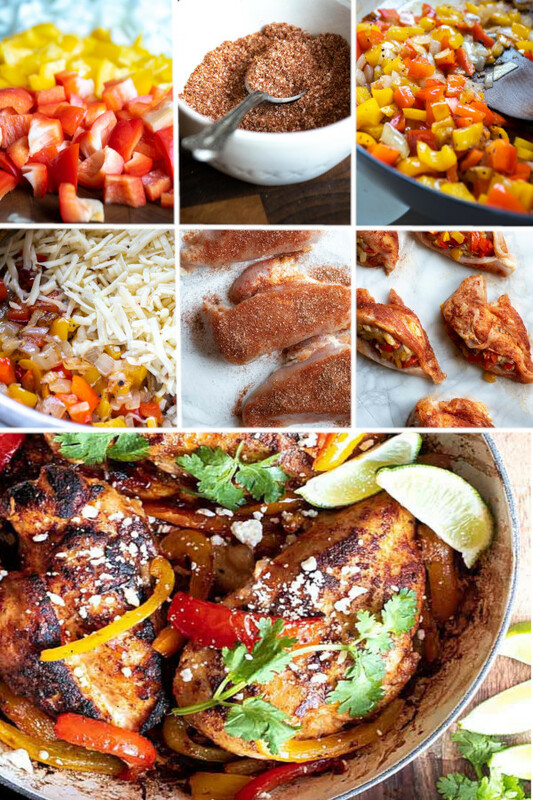 Reheating this fajita stuffed chicken tastes best in an oven or toaster oven. Be sure to leave your toppings off if you plan to reheat your chicken — avocado, sour cream and cilantro are best added after! There you have it friends! The easiest, cheesiest fajita stuffed chicken recipe! 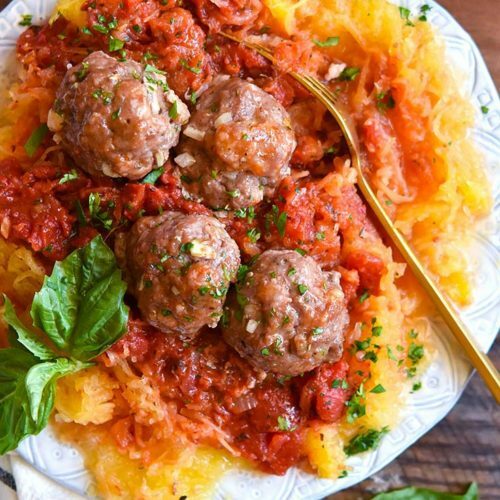 Low carb or not, this recipe is a crowd pleaser — and I have a feeling it’s about to become your family’s new favorite! I hope you enjoy, report back and let me know what you think in the comments below! This Low carb fajita stuffed chicken breast recipe just became your new cheesy, zesty best friend, for decadant dinners and low carb meal prep! 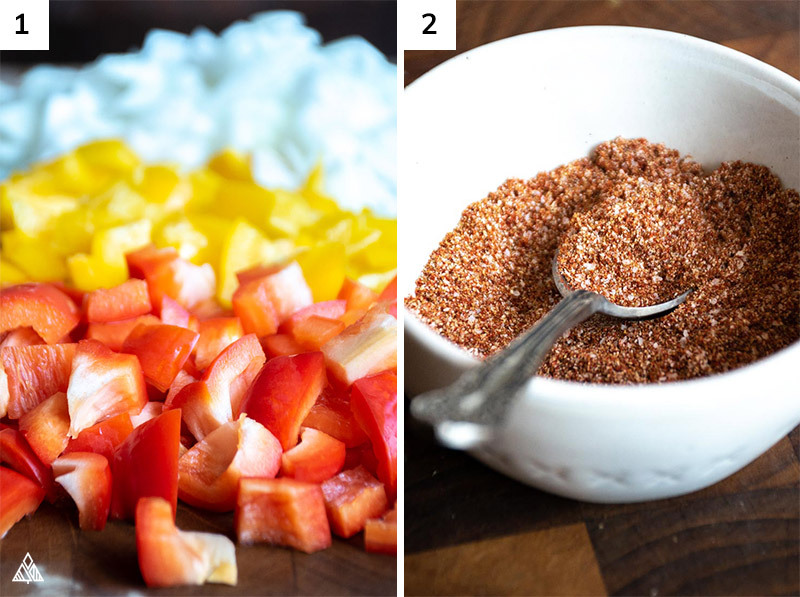 In a small bowl, combine 2 teaspoons salt, smoked paprika, cumin, garlic powder and set aside. Heat half the vegetable oil in a pan over medium heat. 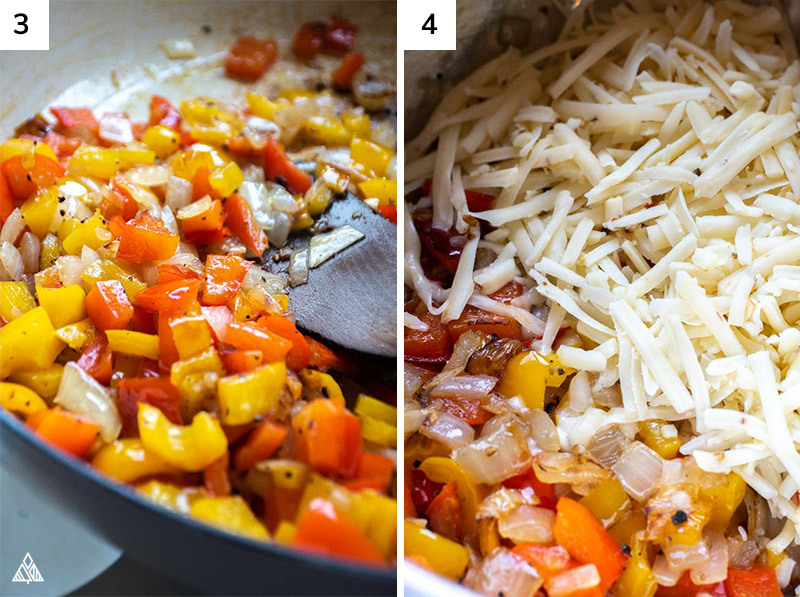 Add diced bell peppers and onions. Saute until onions are translucent. Add cooked veggies to a large bowl with 1 teaspoon of salt, black pepper and shredded pepper jack cheese, and stir to combine. Sprinkle seasoning from the small bowl on top of each piece of chicken and pat into the chicken. Flip and repeat on the other side. Stuff the cheese and veggie combo inside each chicken breast. Serve with cilantro, sour cream, or whatever topping you'd like. And enjoy! 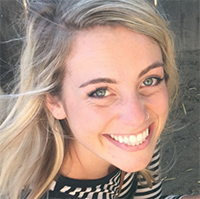 Save some carbs: by cutting back on the veggies, or substituting for lower carb veggies. That’s right, make stuffed chicken breast with stuffing after Thanksgiving (or in the middle of summer if you’re craving low carb stuffing!). It’s a great way to use up those low carb Thanksgiving leftovers! This classic variation will never get old with all the different spinach stuffed chicken recipes you can get creative with! Mozzarella, cream cheese, no matter how you make it, it’s delicious! For a major upgrade to any chicken recipe, try bacon wrapped stuffed chicken! Out of this world. Not only does the bacon add more flavor, it keeps all the stuffing inside without any trouble. Easy, obvious, and a winner every time. Shred you favorite cheese and make cheese stuffed chicken breast — add whatever veggies and spices you’re feeling inside. You’ll love it! For an extra moist and easy low carb dinner, try lasagna stuffed chicken. If you’re looking for extra protein, add some sausage in there, I won’t judge! Broccoli and cheddar — a match made in heaven — taste amazing stuffed inside of chicken! Think of this broccoli and cheese stuffed chicken like a low carb hot pocket! My vote here is pepperoni, sausage, mushrooms and marinara? 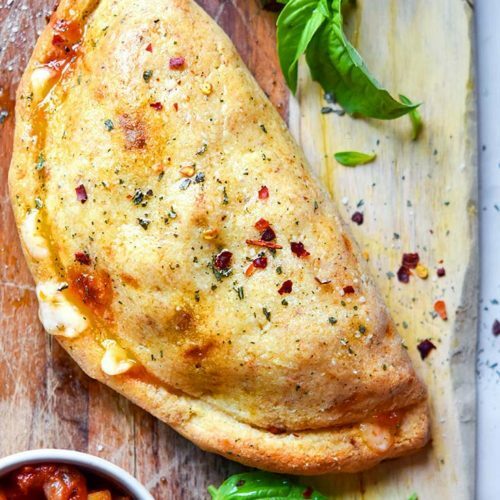 What will you bake inside you italian stuffed chicken breast? Because I was craving that mushroom and thyme combo, I decided to bake them inside mozzarella stuffed chicken, and boy did I love it. Artichokes definitely don’t get enough credit as far as low carb foods go! Add them to spinach artichoke stuffed chicken and you’ll be thankful. The new, tastiest way to enjoy low carb chicken parmesan is inside out stuffed chicken parmesan — that way, your crispy crunchy crust remains crispy and crunchy, while the inside get moist and cheesy. Wow! I can’t wait to make this. Looks so amazing!